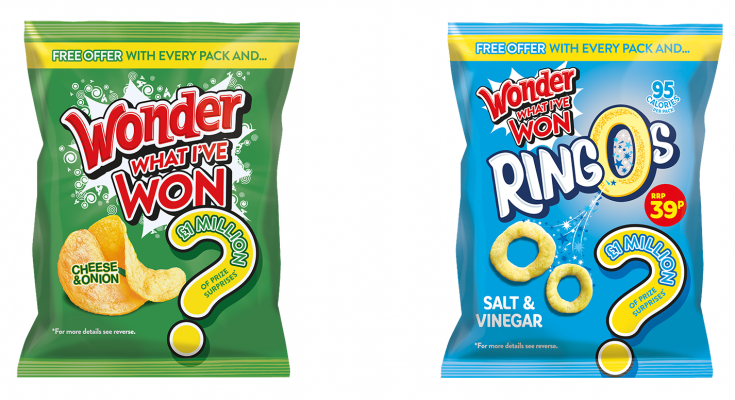 Golden Wonder, the brand that pioneered the concept of on-pack promotions in the 1970s, has launched a large-scale, full pack takeover to give fans the chance to win a prize surprise. A twist on the crisp packet competitions of yore, the ‘Wonder What I’ve Won’ campaign gives shoppers the chance to win up to million pounds worth of prizes, but winners won’t know what they’ve won until they receive their prize. Golden Wonder has printed over 22 million redesigned packs, with the brand and Ringos logos modified to the competition call to action. The packs are now available across the UK. The campaign will be supported by a TV ad, set to air on prime time in Scotland on 22nd April, and nationwide YouTube pre-roll. The campaign will build on Golden Wonder’s resurgence, which has seen double-digit sales growth across the UK as well as its Scottish heartland. Each pack features a unique code which determines winners when entered on the competition website. Winners who share their prize surprise on social have the chance to double-up their win with a box of crisps. And we secured a reciprocal partnership with Gift Inspiration Ltd which, in addition to providing over 133,000 prizes, allows us to offer a £5 voucher to everyone for simply entering their code on the website. Disruptive, delightful and rewarding campaign elements unite under the wonder umbrella for this playful take on the classic crisp packet competition.